Pheromones are in the air!! I do adore romance. Flowers and chocolate and foot massages. But I can't say I'm a fan of Valentine's Day. If you can't make the effort to show how much you love your significant other during the year, then a half-assed commercially manufactured heart shaped token given on an overly hyped arbitrary date is more of an insult than a romantic gesture. Having said that hand made with love is completely different story. And any time of year is good for that. 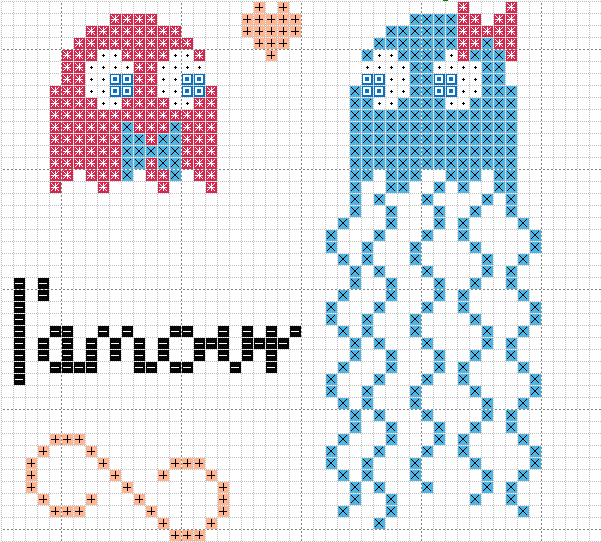 So here's a little bit of cross stitch l'amour. You may indeed have the pattern. Here you go. So if you've got someone to snuggle with get snuggling. If you don't, stretch out on that bed and enjoy the covers just as you like them.